So I got in early yesterday, a day in which I spent several hours thinking was Tuesday but that was of course Wednesday. Where does all the time go? Oh yeah, it goes into crossing one time zone after the other. I'd have gotten home a little sooner if it hadn't been for one of the things I hate the most in Indian airports -- the dreaded luggage cart. Hidden within that herd of carts is the slowly moving baggage claim belt. When you finally see your bag, it's an adventure getting close enough to actually grab it by its handle. The carts are free, so just about everyone takes one, even people with just a couple pieces of luggage, and that means that the luggage is sealed off from its owners by a hedge of shiny, hard-to-navigate metal. 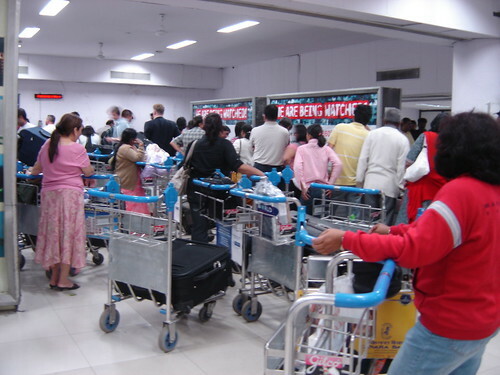 If I ruled the airport system of India (scary thought), the first thing I'd do is make the carts cost money (maybe 100 rs., with half of that refundable when you return it). Most important, I'd make the area immediately next to the moving belt a no-cart zone.